This is the fifth post in a series on Smart Fiber and OTDR Testing – see links to previous posts below. SLM is designed to speak your network language. It features individual variants, like FTTH, FTTA, Enterprise, that address specific applications to make test and certification in those environments even easier. The Cable-SLM reflects the relevant workflows and terminology found specifically in high-density fiber cable environments. It also uses relevant icons, labels, and descriptions to depict link elements and not those used in Enterprise/Data Center or Fiber to the Home (FTTH) deployments. VIAVI SLM also features another bit of OTDR magic called Smart Acquisition, or “SmartAcq”. SmartAcq improves how the OTDR detects events along the fiber link by running multiple tests and combining them into one single view. By using multiple pulse widths SmartAcq can reliably characterize all the sections of a fiber link near and far plus allow you to get away with a shorter launch fiber. This makes the VIAVI OTDR one of the most accurate and repeatable OTDRs available today (not to mention the most compact and lightweight too). And the best news? Basic Smart Link Mapper capabilities are now standard in all VIAVI OTDRs. 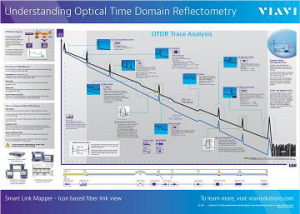 If you want to learn more—visit our Smart Link Mapper web page or download this poster Understanding OTDR.